Plastic bags overwhelming our landfills and winding up in the ocean – it’s become an environmental cliché, but it’s an appalling reality. Now imagine that you can take real action to reduce that problem – and advertise your business at the same time! 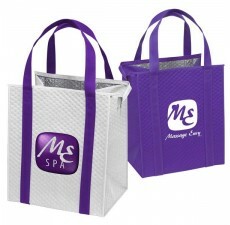 That’s the power of using environmentally-friendly promotional cooler bags as a giveaway to your current and prospective customers. You save the planet and boost your advertising exposure – a classic win-win. Not only does your green message get out to thousands of new customers, you also boost your company’s public commitment to a greener way of doing business. How can you do it? 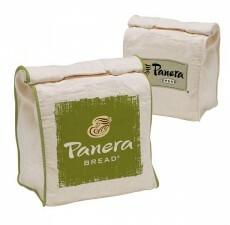 Simple – by using recyclable cooler bags from Custom Grocery Bags, manufactured from post-consumer plastic products. 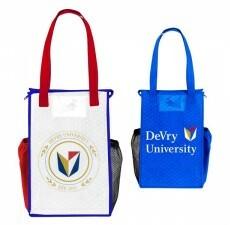 We will imprint the bags with your company logo and marketing message, and you can hand them out as portable billboards at trade events, retail locations, marketing promotions, etc. 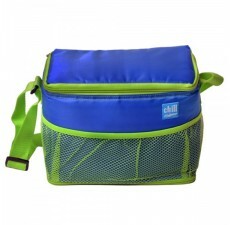 These recyclable cooler bags are durable, affordable and very stylish. 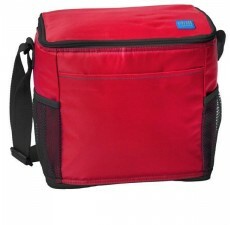 These recyclable cooler bags contain a thermal lining that keeps items hot or cold, making them terrific for picnics, car trips, travel, camping out – anywhere away from the refrigerator. 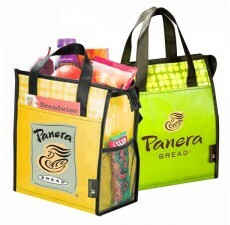 Reusable totes are a great alternative to disposable plastic coolers and cooler bags, and are non-toxic to boot! 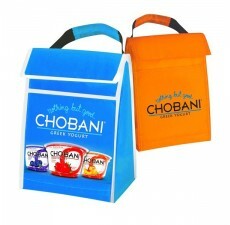 What should you look for in the perfect promotional cooler bag? Costs as low as $0.79! 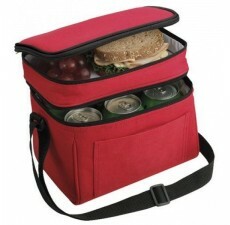 We have developed a line of reusable cooler bags that have all these features and more. 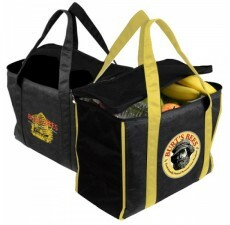 It’s not just cooler bags – We also offer a wide range of cooler backpacks, lunch bags and motor totes in many designs. 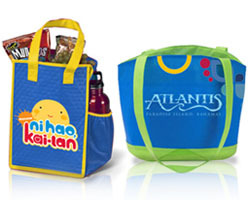 Every customizable bag from Custom Grocery Bags can be personalized with your company logo, marketing message, and whatever graphic designs you come up with. 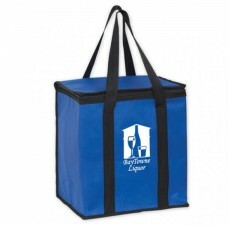 Our attention to detail and high quality standards ensure that your promotional cooler bags look stylish and vibrant, while being reusable time after time. We are committed to doing business in an environmentally-friendly way, and we use safe and sustainable techniques to extract and manufacture all our products. 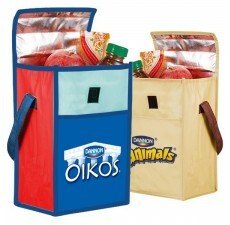 Cooler bags from Custom Grocery Bags are manufactured from a non-woven plastic material called polypropylene. This 5-type recycled form of disposed plastic is extracted from plastic bottles and containers that have already been used – not only is each cooler bag recyclable itself, it’s made from recycled materials! 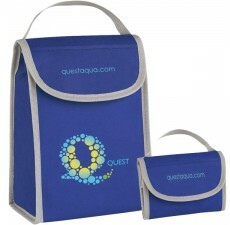 We manufacture stylish and durable bags that help preserve the environment, using resistant but non-toxic dyes and inks that are natural and water based. Deliveries on Time, Every Time! Our well-equipped factory and sophisticated distribution network ensures that your order is delivered on time and on budget, whether you need just a few hundred bags or many thousands. 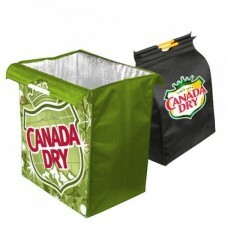 Our careful packaging techniques ensure that your reusable cooler totes arrive in mint condition while keeping shipping costs at a minimum. 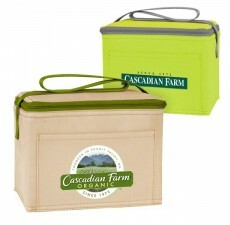 Opt for reusable cooler bags from us and join the green movement. We can help you put your marketing message in front of thousands of new customers, and establish your credentials as a company that cares about the environment at the same time. 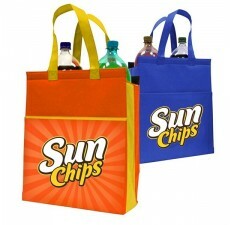 Don’t delay, contact Custom Grocery Bags today !